A few short weeks ago I shared a project I had just finished up for a chic young couple who hired me to help with the main living areas of their newly renovated home. Today I have the pleasure of sharing the dining room and foyer of their classic American home! Ok so in the dining room we kept the furniture they already had, which was a custom rustic dining table and a set of upholstered Parson's chairs. During renovation, they added a very smart looking modern gold chandelier, which offered a modern twist on a classic design. So a pretty good start, right? I may have mentioned this in the previous post, but the clients have quite an eye for art, and bought a beautiful abstract painting while on a weekend trip to Atlanta. Here's another photo of the room with the new piece of art in place. The art is so gorgeous, and we wanted to make a few changes that would really celebrate the painting and bring the whole room to the next level. Are you thinking what I'm thinking? Paint!!! Those pretty white walls just weren't allowing this room to live up to it's full potential. Behold the power of paint!! 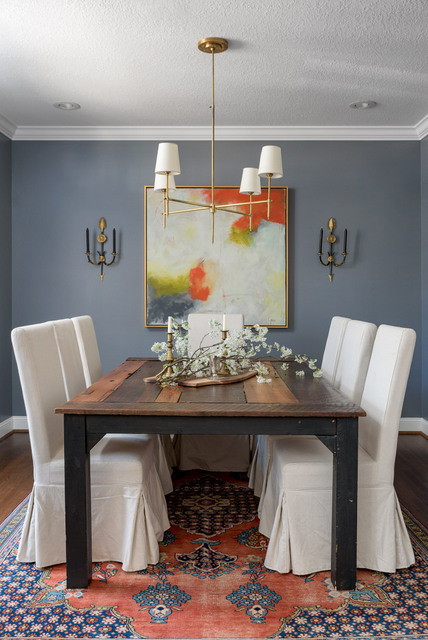 This complex gray wall paint was just what we needed to compliment the painting and we added a fabulous vintage rug and vintage candle sconces to flank the painting. And that's it! Isn't it crazy how just a few simple changes can make such a dramatic impact on a room? Here's what it looked like on my first visit to their home. A super gorgeous foyer that just needed a few personal touches. My clients had this enormous painting commissioned by local artist Vesela Baker, and it's the perfect counterpoint to the rustic bench that was handmade by my client's grandfather years ago. We pulled it out of the master bath to it's new home by the front door and it's so unexpected and yet so right! We're all so happy with the end result and I'm sure our selections will serve them well for many years!! If you're in the Chattanooga area and would like to get on my schedule for Summer or Fall of 2018, contact Kim at 423.653.3186 and tell me about your project!